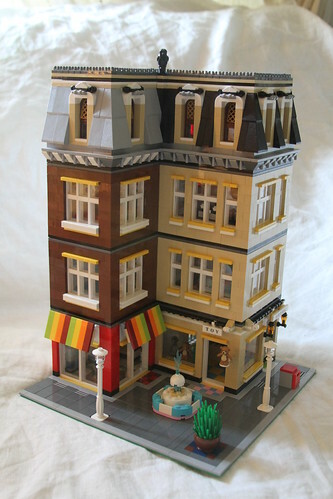 Brick Town Talk: Hobbies and Hospitality - LEGO Town, Architecture, Building Tips, Inspiration Ideas, and more! Playtime Plaza - (BTT) Fronting a lovely public plaza, this little toy shop is hard to miss with its colorful awnings and teddy bear sign - a relic of an era in which children could still be entertained by things that didn't require batteries. Up above is a boutique hotel, each floor decked out in a different primary color so that every guest has a one-of-a-kind experience. Thank you, what a lovely comment to hear!!! You just make my day even better!!! much better, I will carry on and design more cute and lovely LEGO design. Thanks for the great model!